Getting Spicy and Busting Walls with ROOF! Visiting guest artist Ricky J. Martinez brings a melting pot of ethnicities to the University of Idaho Theatre Arts Department. Martinez is Russian, Turkish, Jewish, Catholic, Buddhist, but most affectively, a first-generation Cuban American. 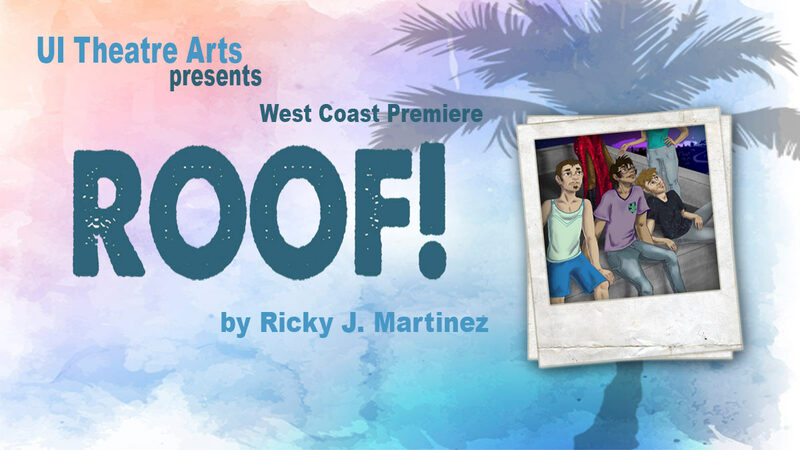 He’s also an award-winning, multi-disciplinary theater artist – a playwright, director and performer – whose play “ROOF!” makes its West Coast debut at the Hartung Theater on Oct. 13-22. “ROOF!” is a tribute to the diversity of people and locales in Miami, Florida – the place Martinez calls home, and a melting pot of cultures, like Martinez, himself. With “ROOF!” he brings that diversity to the Hartung stage with a predominantly Latino cast, as well as an African American character. “ROOF!” revolves around an eclectic group of emerging artists (a photographer, a sculptor, a filmmaker, a bombshell actress and a drag queen) who gather for a Bohemian-style rooftop barbecue. Audiences will find serious issues laced within the comedic exterior, such as gentrification, diversity, ageism and gender identity. Martinez is at UI for six weeks to direct the play, which features four theater students from the College of Letters, Arts, and Social Sciences and a student from Central Washington University to play the role of the African-American drag performer. Nathaniel Addison (Hiko) a senior theater student from Central Washington University in Ellensburg. Martinez will host a discussion on Oct. 14 immediately following the show. Among his many honors, Martinez is the first Hispanic recipient of the prestigious Margo Jones Award (in 2016) and is now in the company of such luminaries as Edward Albee and Joseph Papp. He has directed for the MFA Playwrights Workshop at the Kennedy Center’s American College Theater Festival and Stanford University’s National Center for New Plays. Martinez has commissioned and collaborated with international playwrights on more than 50 world premiere plays and has sat on the executive committee for the National New Play Network, the advisory board of the Latino Theatre Commons, the National Endowment for the Arts panel and National Fund for NewMusicals. NOTE: "ROOF!" contains adult language and situations and may not be suitable for children. Tickets are available now at BookPeople of Moscow, at UI Theatre Arts, Shoup Hall, Room 201, by phone at 208-885-6465, or at the door 60 minutes before curtain. Tickets are free for UI students, $5 for children 12 and under, $10 for UI faculty, staff and seniors 55 & over and $15 for adults.